HER name is Lady Gaga-ntuan and she was definitely born this way. Scientists from the Museum of Victoria have rediscovered Australia’s longest stick insect near Cairns, during an expedition into the rainforest in January. Measuring half a metre long, the insect is only the third female Gargantuan Stick Insect (Ctenomorpha gargantua) specimen to ever be found. 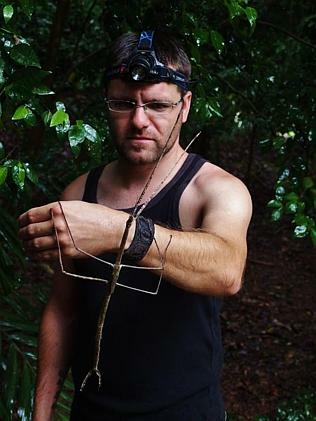 Museum Victoria live exhibits keeper Maik Fiedel said the insect, dubbed ‘‘Lady Gaga-ntuan’’, was the Holy Grail of stick insects, with entomologists searching the rainforest high and low since the initial discovery of a large female specimen in 2005. “Compared with other large stick insects, it’s like discovering a person who is almost 3m tall,’’ he said. Stick insects have evolved to be extremely well camouflaged. Mr Fiedel said it could take up to 20 minutes to find the animals on a small plant. He said the strangest thing about Lady Gaga-ntuan, however, was that the insect had managed to stay hidden for so long despite its size. “One theory is that it lives in the canopy of the rainforest,’’ he said. Since its collection, the long-limbed lady has died, however she still managed to lay 12 eggs which were expected to hatch in coming months. The insects usually live for nine-12 months, suggesting Lady Gaga-ntuan was naturally near the end of her life at the time of her capture. Her body is now part of the museum’s entomology collection, and will be the subject of future studies. Re: HER name is Lady Gaga-ntuan and she was definitely born this way. The biggest giant stick insects that I have seen in my backyard here have been maybe 30-35 cm long. Or roughly 60-70% of the size of those "Gargantuan" monsters up in FNQ. A lot more common though, are the average 10-20 cm long varieties of stick and leaf insects that many people would be more familiar with. The camouflage on them is so effective that oftentimes you can be right next to them and don't see 'em until they move.. The largest that I have encountered down here, that looked a lot like that chappie on that man's arm in the photo', have been on the outside of screen doors and window screens, where they were much more easier to see. Never been to one of their shows, but like the wrestlers before them, still see more than enough on TV commercials and promotions..
On the OP, though -- when does a stick bug become a "branch bug?" Damn.